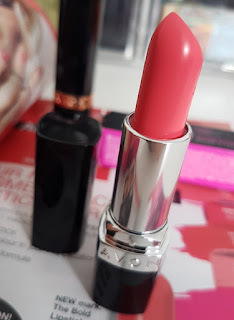 As I promised in my last post (featuring the Avon True Colour Perfectly Matte Lipstick Blushed Shades and the new Supreme Nourishing Lipstick shades), I'm back again today with the second half of my Avon Lipstick swatch-a-thon! Today I'm bringing you the mark. The Bold Lipstick swatches, which if I am not mistaken is a rebrand of the old Ultra Colour Bold Lipsticks. Even still, I have the range here in swatch format to show you all of the shades. The Avon mark. The Bold Lipsticks are marketed as being Avon's most pigmented lipstick ever. It comes in a range of 12 shades and each one is made up of a rich, moisturising formula and contain SPF15. They also promise vivid colour in just one application and that they will stay put for hours. Each of them come packaged in the new Avon mark. style packaging, but the one that I received did come in the old Ultra Colour Bold packaging. This means that whilst the tube of the lipstick in the above photo looks different to the one in the book, the shades in the swatches are still the same. As with my previous post, these swatches aren't my regular lip swatches due to a minor outbreak of perioral dermatitis. Therefore, all swatches are on my arm. Apologies to those who do normally come here for lip swatches! For a better representation, I have photographed them in two different types of lighting. Longevity wise they're above average in comparison to other Avon Lipsticks, clocking in at a good few hours, but there is something else to keep in mind. When they say there's a lot of pigment in these lipsticks, they do mean it. That also then leads on to staining. Make sure that you have a good makeup remover to take it off fully at the end of the day or you may end up with a tint left behind! Overall I think that it's a good little collection. I think they fit the mark. ethos well in regards to the being fun and playful with colour and makeup. Some shades do seem to be sliiightly sheerer than others, but an extra stroke or two across the lips and it makes up for that in regards to opacity. If you are one who prefers that affordable punch of colour over subtlety, then these are worth checking out. You can purchase the Avon mark. The Bold Lipsticks at my Avon store (UK and courier delivery only). What are your thoughts on the Avon mark. The Bold Lipsticks? Which shade is your favourite?